Tshwane IOPSA Sub Committee - "Be the change you want to see"
The plumbing industry has moved forward in leaps and bounds driven by IOPSA with Gary Macnamara at the helm steering our ship. Gary as many know has moved on to greater challenges in life. He has left us with a thriving IOPSA community on which we get the privilege to grow, and with this privilege I am proud to announce the beginning of the Tshwane IOPSA Committee. This will allow plumbers in the Pretoria area to get more attention in terms of meetings in Pretoria helping us grow the Tshwane IOPSA plumbers community. IOPSA's core belief is to uplift the standards by getting involved with every IOPSA member, helping them with their business, providing support in the latest trends within the plumbing industry and forming partnerships with businesses to provide IOPSA members with better discounts like the incredible deal they have with the NP200 that is R40 000 cheaper. Providing Training in the latest SANS regulations that are being updated. Things that I know as a plumber are essential to my business growing to the next level. As we all know IOPSA is a Non-profit volunteer driven organisation and without the plumbers it cannot deliver what we as plumbers truly need - support. We are so alone in our businesses grinding away struggling with the same problems but no one to talk to. Imagine being able to get together and find out how another plumber solved the same problem you had? Or this new job you are taking on and have no experience in it and being an IOSPA member you can call them and get the advice you need. This is why I am on the Committee, I want to be the difference I desire to see from others. I am tired of complaining and not seeing results. I want to be the change, not the problem, which is why IOPSA’s tag line of “Be the change YOU want to see” resonates with me. Being part of the committee and attending the IOPSA meetings my business has grown. I have learnt of new opportunities in the same jobs I do every day just because I attended a meeting that was so skilfully put together my Kaela and the IOPSA Gauteng committee. They are doing their best to give their best to us. This has truly inspired me and encouraged me to do my part in making South Africa great again. I am not going to wait for someone else to make the change. So come and join us, by just being part of the meetings and encouraging those around you to attend, we will be that difference that you want to see happen in the South African Plumbing Industry! I had the most wonderful experience and just need to thank IOPSA for the opportunity. I was going about my regular day, going through all my emails when suddenly this email with an NP200 for a ridiculous price popped up! This can’t be right, I thought, then I see it was for IOPSA members and knew it’s those legends at it again! Working on getting its members the benefits. I jumped at the opportunity because last year I had just bought an NP200 and the deal was not this sweet and the service was bitter. This deal at the same price had a Bluetooth radio, contractors rack and the safety pack. So, I gave them a call and started the process with the bank to get my funding. What a wonderful experience dealing with CMH Nissan. Being in Pretoria and CMH Nissan being in Durban I would either need to get the vehicle trucked up here or go and fetch it. CMH Nissan had me covered either way. One of my main concerns as I had opted to fly down and enjoy Durban for a few days was how would I get to CMH Nissan. Would I need to hire a car for a 45min drive? I asked if they would be able to fetch me from the airport and immediate response was that won’t be a problem. They even waited for me to finish my breakfast at the airport. The driver was polite and so friendly. On arriving at CMH NISSAN you get first class treatment. 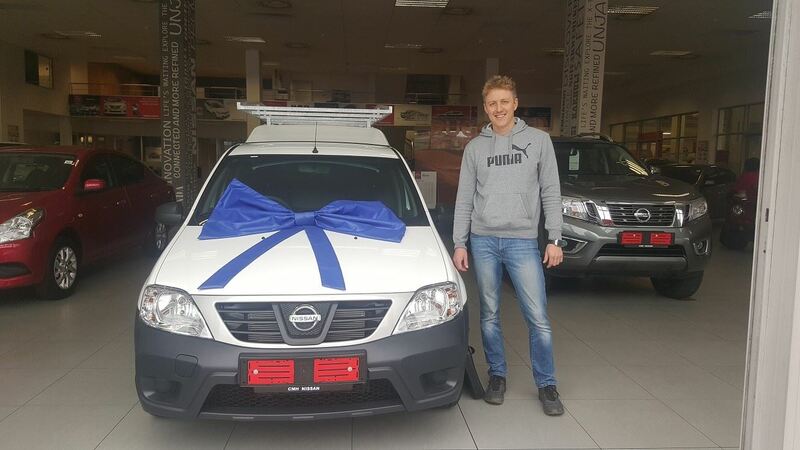 The bakkie was ready and waiting with a large blue ribbon on it, it’s those extra touches that just make one excited to buy another work vehicle for my employees to be able to rescue another client. The general manager and sales manager came to congratulate me on my purchase and to check if everything went well. I won’t even go into the horror story of the previous NP200 purchase. This was a dream. I got a call the next day to check that everything was in order. What a wonderful experience with a company that is doing what it can to help us small contractors grow our businesses with cost effective and reliable vehicles. Thanx to CMH Nissan and IOPSA I am ready to rescue another client from their plumbing nightmare. Getting rid of PVC pipes in today's times has become a job in it's own as some landfills refuse to take them and the pipes most likely end up in a pile at our workshops and offices. But no longer! Plasticomp is a Gauteng based company that recycles PVC (blue, white and cream pipes, conduit and trunking) and LLDPE (Jojo tanks). They collect pipes, fittings, shavings, off-cuts in and around the Gauteng area. Please contact them to clean up your site and to remove all your off-cuts and trimmings. They pay per kg for the material that they collect. Below is an image taken out of Plumbing Africa, let us look past the water pipes and only focus on the 110mm UG drainage pipes. 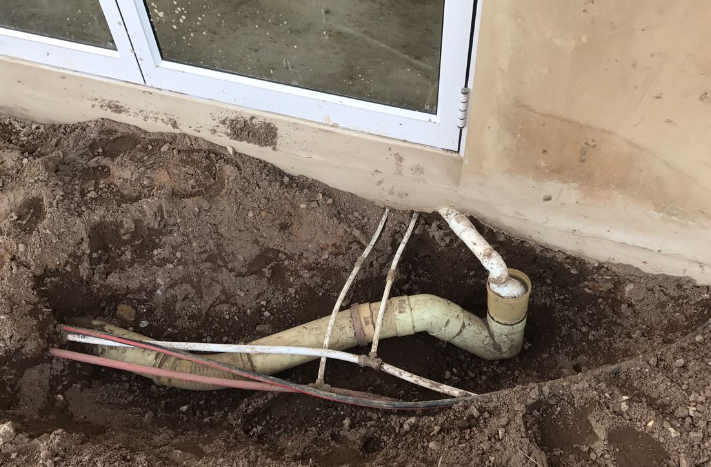 This is a widespread problem on today’s construction sites, the required drainage levels can’t always be achieved and the plumber is left to try and find a solution to the problem. So, what to do in this situation? I have attached an easy to understand diagram below of a solution that is easy to install and cost effective. 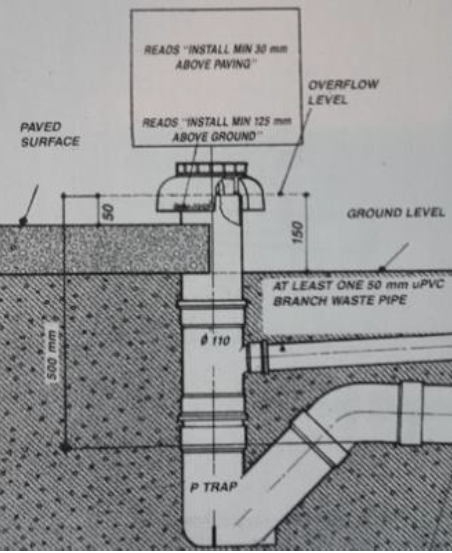 The diagram is of a basic overflow gulley head installation that can ensure your installation is compliant with the standards on completion. IOPSA’s Western Cape region has had a tough time of it lately. There are rumblings on the ground and murmurings in the air that suggest that IOPSA as an organisation is failing in its mandate. Speaking of which, just what is its mandate? Why does it exist? What does it do for the plumber, and why should he/she part with hard-earned cash to be part of it? Well I’m not here to give a lengthy nuts-and-bolts dissemination of every detail of IOPSA’s role in the plumbing industry. What I can tell you though is that at the WC regional level (driven down from National), one thing has started to come sharply into focus as a non-negotiable: Service. Service to the plumber and the industry. There needs to be value for the plumber. There needs to be a perception of “getting something out”, and it needs to start with the EXCO members. One thing’s for sure- the people in the organisation, from National down to regional EXCO volunteers- are rock solid, we all collectively have the same goals and passions to see the INDUSTRY grow. Without a successful and thriving plumbing sector everything else falls apart. Now we can sit and debate just how this is to be achieved, and we will- but for now we need you to know that certainly at WC EXCO level, (And I’m sure I speak for all others) there will be a concerted drive to start to serve you, the plumber. 1) More events, and in more locations- In the past there may have been 3-4 plumbers evenings in the Western Cape per year. And most if not all of those would have taken place in and around Cape Town. Guys and girls from Paarl, Worcester, Hermanus, Stellies...all of the outlying areas have had to travel extensively to get to these events. And they have been! We want to try our best to change that, to move the events around and hopefully have plumbers evenings and other events outside of Cape Town. 2) More info at plumbers evenings- Although there has always been valuable information and material available at these events, we would like to up the ante a bit. I, as the technical representative of the WC EXCO would like to introduce a technical session at each plumbers evening. The content of these will vary, but I would like to start to unpack the SANS requirements and have discussions around those. Also, we are hoping to set up more interesting events such as factory tours and in-depth product knowledge. These are always fascinating and welcomed by most technically-minded people I know. 3) Promotion of members- We hope to find ways of driving home the message that to use properly trained plumbers is non-negotiable, and the advantages of using plumbers that are registered with the industry bodies such as IOPSA and PIRB. 4) Bridging gaps- As mentioned earlier, there are a great many plumbers that feel like they have been let down by IOPSA, or that IOPSA is self-serving, or that IOPSA is only in it for the money, or that…or…or….. Well we hope to change that. We believe that all roleplayers in the plumbing sector want the same thing- for it to be thriving and sustainable. Is there a sure-fire way to get everyone singing off the same hymn sheet? No, but it starts with reaching out, cooperation, discussion and HEARING one another. The guys and gals that are passionately dead-set against the notion of an IOPSA or similar body are EXACTLY the ones we want in our corner. Their passion is already clearly evident, and that is gold. Border's 1st Annual Plumbers Games a SUCCESS! On the 24th of August 2017 IOPSA border region hosted the very first Annual Plumbing Games. This was held instead of having a regular plumbers event for a little fun. The event was hosted at the Plumblink showroom where snacks and drinks were served to keep the players hydrated and fed. 1. The Geyser Relay – where teams were made to carry a geyser using only a rope. 3. Toilet Basketball – Teams had 60 seconds to dunk as many balls into a toilet pan within the time limit. 4. Polycop tug of war – teams were asked to play the good old game of tug of war which seeded out the men from the boys. 5. Tap reassemble – Teams had to reassemble a tap as fast as possible while blind folded! There were four teams who took part in the event and they were able to select their own team names. The event was a great success and the teams had great fun. IOPSA KZN was fortunate to Host Mr Domenico DiGregorio at the Grohe Dawn Lifestyle Design Centre in Durban on 29 June. Resource-Oriented Sanitation Treatment Systems, a program managed by ANSI with support from the Bill and Melinda Gates Foundation to help facilitate advancements in non-sewered sanitation products. With over 80 participants submitting reviews, comments, and recommendations, this workshop will prove instrumental in furthering development of new technology and solutions to improve access to hygienic sanitation for the 2.5 billion people living without this basic human right. While in Durban, Domenico was also a guest speaker at the local meeting of IOPSA (Institute of Plumbing South Africa). IOPSA members have been some of the most enthusiastic supporters of PWB since our inception, and their passion to serve their communities is abundantly evident. plumbing and sanitary needs. Thank you to Steve Brown, IOPSA Operations Manager, and the entire membership for their warm reception, amazing hospitality and long-standing support of the PWB mission! Over the past two years Gary Macnamara has been the executive director for The Institute of Plumbing South Africa (IOPSA). Within his role at the organisation, he has achieved and conquered any challenge put before him and this is a trait of his that will be dearly missed. Every beginning has an end. And every end is a new beginning. Macnamara leaves the IOPSA team to relocate his family to New Zealand and tackle new adventures that may lay ahead. At a small farewell gathering, Macnamara was given a multitude of gifts from the organisation to help him on his new adventure to New Zealand. IOPSA would like to wish Macnamara and his family best of luck for their new chapter and every success in their future. For the IOPSA offices, it is still business as usual. 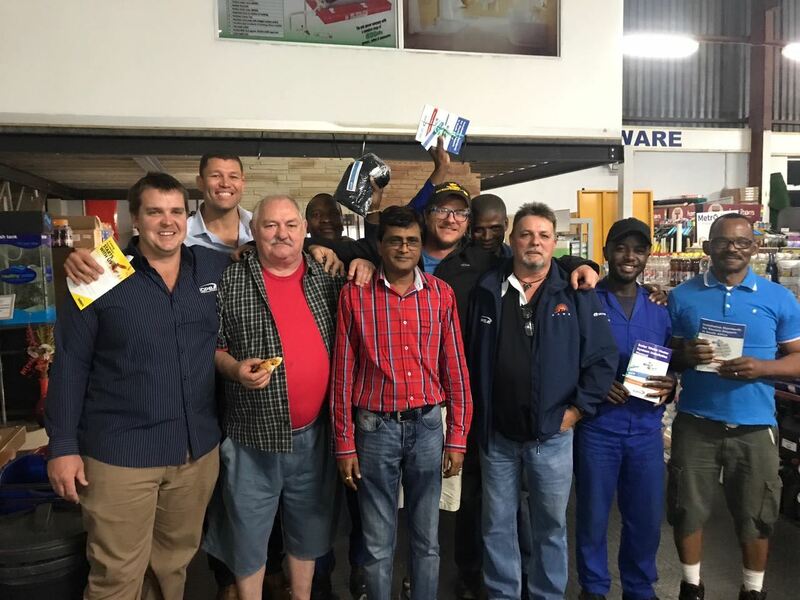 The IOPSA KZN committee Travelled up to Richards Bay to hold a Plumbers evening on 19 July and were met with some old and new faces. The evening was informative and as always, Gopal Bissessur of Aqua-Tap Plumbing Richards Bay was a phenomenal host and sponsor. One of the highlights of the Evening was the story of a keen plumber who, along with his assistants, travelled a round trip of approximately seven hundred kilometres to join in on the evening. Some commendable commitment from Simphiwe Cele of Plupacati Plumbers. The evening was an informative session, followed by Questions and Answers from the Plumbers pertaining to industry. Pictured; IOPSA Representatives, Gopal Bissessur of AquaTap and Plumbers enjoying their Prizes. IOPSA KZN was fortunate to Host Mr Domenico DiGregorio at the Grohe Dawn Lifestyle Design Centre in Durban on 29 June. Patrick Gordon of Grohe Dawn lead with an Informative talk, thereafter Plumbers were treated to shared experiences and insight into the Plumbers Without Borders journey along with some of the interaction on Local matters. Mr DiGregorio and the team at Plumbers without Borders have been growing from strength to strength, being instrumental leaders in the upliftment and reestablishment of many disaster and rural areas. To join Plumbers without Borders from any type of participatory level, visit their website; www.plumberswithoutborders.org.